If you DAYTRADE, I think our DAYTRADE systems are a great educational tool as well as consistent money makers. Of course past performance is not necessarily indicative of future results. The original FT system, my father's bread and butter system, was designed in 1992. We updated it to our VB system in 1997. Two trades in a single day are rare. Here, the system had two winners, hypothetical. In volatile markets, the counter trend component of the system can be helpful. 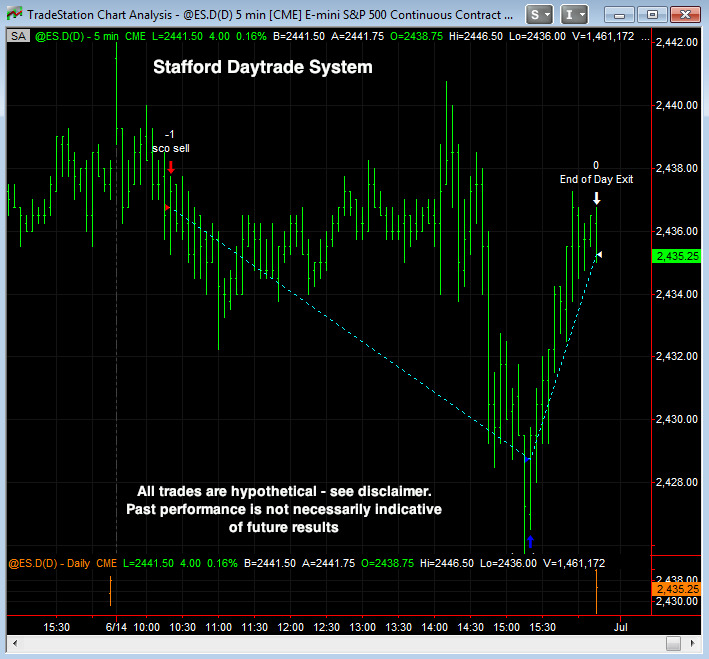 The system had a counter trend short trade in the morning and a counter trend buy in the afternoon. Covering the long trade at the end of the day. Of course past performance is not necessarily indicative of future results. ALL results on this site are HYPOTHETICAL unless otherwise noted. Past performance is not necessarily indicative of future results. HYPOTHETICAL PERFORMANCE RESULTS HAVE MANY INHERENT LIMITATIONS, SOME OF WHICH ARE DESCRIBED BELOW. NO REPRESENTATION IS BEING MADE THAT ANY ACCOUNT WILL OR IS LIKELY TO ACHIEVE PROFITS OR LOSSES SIMILAR TO THOSE SHOWN. IN FACT, THERE ARE FREQUENTLY SHARP DIFFERENCES BETWEEN HYPOTHETICAL PERFORMANCE RESULTS AND THE ACTUAL RESULTS SUBSEQUENTLY ACHIEVED BY ANY PARTICULAR TRADING PROGRAM.ONE OF THE LIMITATIONS OF HYPOTHETICAL PERFORMANCE RESULTS IS THAT THEY ARE GENERALLY PREPARED WITH THE BENEFIT OF HINDSIGHT. IN ADDITION, HYPOTHETICAL TRADING DOES NOT INVOLVE FINANCIAL RISK, AND NO HYPOTHETICAL TRADING RECORD CAN COMPLETELY ACCOUNT FOR THE IMPACT OF FINANCIAL RISK IN ACTUAL TRADING. FOR EXAMPLE, THE ABILITY TO WITHSTAND LOSSES OR TO ADHERE TO A PARTICULAR TRADING PROGRAM IN SPITE OF TRADING LOSSES ARE MATERIAL POINTS WHICH CAN ALSO ADVERSELY AFFECT ACTUAL TRADING RESULTS. THERE ARE NUMEROUS OTHER FACTORS RELATED TO THE MARKETS IN GENERAL OR TO THE IMPLEMENTATION OF ANY SPECIFIC TRADING PROGRAM WHICH CANNOT BE FULLY ACCOUNTED FOR IN THE PREPARATION OF HYPOTHETICAL PERFORMANCE RESULTS AND ALL OF WHICH CAN ADVERSELY AFFECT ACTUAL TRADING RESULTS. STAFFORD TRADING HAS HAD NO EXPERIENCE IN TRADING ACTUAL ACCOUNTS ON THIS SYSTEM. BECAUSE THERE ARE NO ACTUAL TRADING RESULTS TO COMPARE TO THE HYPOTHETICAL PERFORMANCE RESULTS, CUSTOMERS SHOULD BE PARTICULARLY WARY OF PLACING UNDUE RELIANCE ON THESE HYPOTHETICAL PERFORMANCE RESULTS. Stafford Trading Company and its principals are in no way related to or have any business association with John S. Stafford, Jr. or Stafford Trading, Inc.